CPSIA - Comments & Observations: CPSIA: It's the "Why", not the "What". CPSIA: It's the "Why", not the "What". It's Sunday morning and the sun is shining (it finally stopped snowing in Chicago!). I feel refreshed and am ready for a short break. Will you come with me? Get away from your day-to-day CPSIA troubles? Okay, let's go! I have been puzzling about this question for the last several days. We have seen the Resale Industry wake up and create a firestorm of protests. Their CPSIA petition is now over 54,000 strong (http://www.rallycongress.com/make-second-hand-kids-clothes-legal-/1471/save-kid-s-clothing-resale-consignment-thrift-stores-from-closing/) and growing. We have seen many, many TV segments on the pain of complying with this law (go to www.learningresources.com/CPSIA for some of the videos). We have seen trade associations come out of hibernation and begin to advocate for carve-outs on wood, metals, gems, natural fibers and so on. Consumer advocate groups have joined forces to write the CPSC to criticize their implementation process and urge them to address these important issues. Most amazingly, I have witnessed debates between intelligent people over whether it is appropriate to test cloth dolls for lead content, test wood for phthalates, whether anyone besides Uncle Fester is at risk from a little dot of solder on the bottom of a microscope light bulb. None of this makes sense to me - does it make sense to you? So why is that? What is it that I don't get? Have I lost what's left of my mind? Apparently, after 18 years in the toy business, I must have no idea what constitutes a safety risk because I just don't see it, and because I don't see it, I don't understand the debates of these intelligent people. I find the focus on the different materials and industries surreal. I can't understand why we need exemptions for so many materials well-known to be safe already. 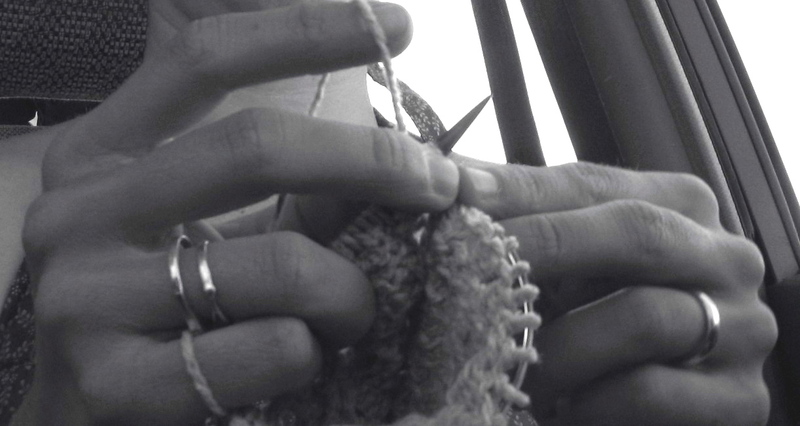 How could thrift shops and charities be doing something bad? Somehow, I sense that the discussion on safety has been diverted away from the real issue. Is it just me that's missing the point? I can only offer ONE explanation: The members of Congress and consumer "advocates" who are behind this law have given the entire country a massive "head fake" - they have us looking left when we should be looking right. It seems that no one is looking in that other direction. The media wants us to worry about the testing - how will we do it? - and others want someone to blame - the CPSC. But is that REALLY the problem? No, no it isn't. The problem is the law itself. Those who have been tracking me for awhile are not surprised to know I think the root problem is the law. Why is this such an important point? It's really simple, actually. Implementing rules cannot fix a law that makes no sense. A swiss cheese law (a law with ten zillion exceptions and exemptions) is unintelligible and costly. No one can deal with it (have you ever heard any criticism of the tax code???). Let's go back to reality: put yourself in our shoes. At our company, we are law-abiding, safety-loving educators who want to make and sell valuable teaching tools, and we are faced with a broad law that regulates what we do. How shall we deal with this complex situation? The first step is obvious - read the law. We did, we read the CPSIA. It says everything's illegal, all the things that we make, unless we prove they are legal. OMG, you're kidding! No, wait, somebody told us that the CPSC has written some "implementing rules". We look there, and somebody spots a rule on page 7 that says wood and certain fibers are okay. Yippee, that's something at least! And there's another one on page 18 and we think this one paragraph on page 37 might do us some good (you know the one, subparagraph 1513.3(a)(ii)(C)(IX)). . . . We hear from a customer that there was a FAQ . . . so we download every FAQ since 2007 and scrutunize them with four lawyers at our side. One guy thinks perhaps FAQ no. 36 was written for us. It says that science items are okay if we have labels, and instructions, and they are for ten years olds . . . . That doesn't address our problem of trying to sell microscope light bulbs, but now we have fewer problems. And then we get a letter from the General Counsel who says many of our products are educational, not toys, so they aren't subject to some parts of the law, can't we figure the rest out ourselves. . . . We get our experts together, have a week-long debate, and decide how we want to "play it". Then we start hearing from our customers - they just want lab certificates because that's what the law says is required. We ask them, haven't you read the FAQs, the implementing rules, the interpretations, the private correspondence we had with the General Counsel, had a week-long confab with your experts, etc. They repeat, the law requires certificates, where are they? Where are they? Where are they? When a law works properly, you can read it and understand what it means. [That's a quote from Duh Magazine, thanks to Andy Borowitz.] When the law says one thing unambiguously, and then you have to look ten other places to find all the exceptions, carve-outs and interpretations, and gather a team of experts to assess the risks involved in going to market with your cloth dolls or your cottage industry making flower girl dresses or your science kits for fourth graders, commerce ends. A legal system comprises of Gotchas is not a legal system in my book. The CPSIA has to go. It was misconceived and cannot be fixed. The lead standards need to be refocused on lead-in-paint ONLY (perhaps with special rules on lead jewelry for kids). The definition of a children's product needs to be capped at six years old. Tracking labels needs to go (be voluntary ONLY - not compelled). All retroactive effects need to be removed and buried. The Resale Industry needs to be protected in the new rules - we cannot disenfranchise so many people who depend on that industry. And so on. Let's go back to the smoothly functioning economy we had before Congress decided to "fix" it. The CPSC can be empowered to do its job, and with an appropriate refocusing of resources and a more realistic strategy about how to improve compliance, can be effective in doing what all of us parents want, which is protecting consumers and children. oh thank heavens! See, I only graduated HS early, did 4 years in the Coast Guard, finished my general ed, went to a votech for my nursing license and got an A in Microbiology...I'm known in my circles as an intelligent person, but I was really beginning to wonder if I wasn't really that smart-because I can't understand something put out by the government-yeah right! This has got to be one of the most ill conceived ideas EVER and I'm positive that there WILL be some sort of reprieve. The question is, will it come soon enough to save all these industries and incomes? Several people I know have already started closing up shop. SOme might think me a fool for continuing business as usual right now, but what choice do I have. I'm not ready to roll over and play dead for the CPSC! Congrats, you have hit the nail on the head!!! I completely agree and I think this is what many people have concluded. However, the question is how often does a law get nixed? What is the process to make CPSIA go away? Are we looking at another 2 years for this to be corrected? Most of us can't wait that long. I read somewhere that changing a law that is already put into legislation is almost impossible to do, is this true? I think what a lot of people are wondering is what exactly are we all looking at here? How does this law get "cancelled" if that is possible. I am not familiar with the rules of how legislation works but Rick if you have a group of lawyers there maybe someone can write a blog post on what we are really looking at and what the process is for changing this mess around. 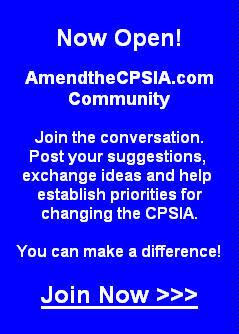 What do we, the people, have to do to make CPSIA go away? If we know that answer I think many will take action. i have to agree. well said and i'm hoping for that change. I agree!!! Why are we all scratching our heads trying to figure out how to comply with CPSC regulations? Excellent point, Rick, we've lost direction. Let's just get rid of CPSIA altogether, focus on the culprits & figure out how to fix the real problem. As someone who paints for a living (with acrylics & latex), I'd also like to see the focus off of non-toxic American paints & focused more on the origins of the lead-based paints. Let's not forget us artists & painters in all of this. If art for kids was somehow lost in this struggle, that would be tragic. The best solution, probably our only choice right now, is to carpetbomb Congress with your views on this law. There are many petitions circulating - sign them all. I will post them later as a recap. Call, email and fax - daily if you have the time and energy. These contacts add up. We have found at least three Congressmen and one Senator who stood up already. There will be more, soon. YOU are the ones who will force it. Go get 'em, Tiger! I don't want your job but I want to be you. Please feel free to pass it on to anyone and everyone and post it wherever you wish! That's just what I think, too. This whole thing is so ridiculous! A man of common sense! Thank you! CPSIA - It Has Come to This . . . .
CPSIA - My "Wish List"
CPSIA - Who is Defying Whom? See No Evil, Hear No Evil . . . Speak No Evil? Maybe I'm Just Slow But . . . I Don't Get It. CPSIA - What do we do??? Who Will be Left Standing When It's All Over? Endless CPSIA Problems . . . .
CPSIA - The Emperor Has No Clothes! Your Comments are Getting Me Charged Up!